I didn’t vote for Gough Whitlam in December 1972. I was seventeen, and far too young to vote in those days when the voting age was 21. But if I’d been able to vote for Gough, I would have. The exhilaration, the vision, the feeling of shucking off the grey dust coat of a seemingly-unending Liberal government has never left me really, and I’ve never in my life been able to countenance the thought of voting for a Liberal government. There have been individuals in the Liberal party I could have voted for (Fred Chaney, Petro Georgiou; dare I say Malcolm Turnbull?) but never the party as a whole. Mungo MacCullum’s book ‘The Whitlam Mob’ makes no pretence at being balanced. Mungo was/is a Labor man in the press gallery and this book is written with nostalgia, affection and loyalty. He is a comic writer, always on the lookout for the quick laugh and the quirky detail. Let’s face it- he’s a gossip and here he’s regaling us with yarns. The first thing that struck me about this book was that there is only one woman: Margaret. I think of the Whitlam years as a watershed for women in Australia but when I check Whitlam’s three ministries (counting the first one which comprised just Whitlam and Lance Barnard), there were no women ministers at all. The second thing that came through was that many of these men had been waiting decades to form government and many of them were old when they got there. Many of them had lived through World War I, the Depression and were WWII veterans; they had endured The Split that had formed the DLP; they had a history of years and years of Opposition. Clyde Cameron, for instance, held the parliamentary record for thirty one years in the House of Representatives, twenty eight of them spent on the Opposition benches. Reading through this book, I realized that I have many misconceptions about that government over forty years ago (remember, I was only seventeen). The changes wrought by the ALP were (and still are) so BIG, both conceptually and in terms of political courage, that I forgot that Gough was from the Right of the party. I’d not particularly been aware of the struggle between the Left and the Right in the party. I’d forgotten that Jim Cairns had actually been seen as a potential Prime Minister. And looking back, the idea of two men (the duumvirate) forming the whole ministry, as Whitlam and Barnard did between 5-19 December 1972, seems unthinkable today. It was a courteous, even flattering letter: Whitlam said that Menzies might be surprised to learn how much the Labor leader had always admired him, not only for his mastery of parliament and politics, but also for his resilience in coming back from defeat to shape the Liberal Party into a modern and dynamic force. This, said Whitlam, was an example he had always held in front of him during his own long battles within the ALP. I wish that there were pictures in this book because, quite frankly, I can’t remember some of the people he writes about. 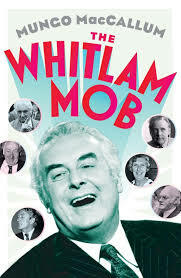 Most of the Whitlam Mob I can remember, although I don’t have a mental picture of Don Willesee. But for the Other Mob: Bill Wentworth, David Fairbairn, Magnus Cormack, Michael Hodgman- nothing. When I think of Lance Barnard, I think of a grey hat- in fact, I think of hats for many of these men, because they were of the black-and-white generation that wore hats, no matter how much I want to drag them into the bright, full-colour and shiny ‘It’s Time’ frame. Particularly for the Whitlam Mob entries, there are many times when MacCallum uses the adjective ‘complex’, but his sketches of the Other Mob are more one-dimensional. I don’t know if this reflects the subject, the author, or his access to them- probably a combination of all three. There are many ‘what-ifs’ and good ideas bungled amongst the short Labor grip on power. The Khemlani loans affair, for example- the stuff of pure farce, and yet what vision. On this day, when I learn of Gough’s demise, I think of myself as very much a product of the changes wrought by the Whitlam government and the vision of a society that it promoted. Thank you, Comrade. This entry was posted in Book reviews, Politics. Bookmark the permalink. I doubt anyone much younger than us can ever understand what 1972 was like. The love, the passion and not to forget the hate. How my grandparents loathed him, somewhat ameliorated later but not by much, by giving the over 70s a non means tested pension. It is a sad day for Australia. I have heard about the evils of all conservative parties since the DLP sunk the Labour Party’s chance at government in the early 1950s. I was too young then to know what it meant, but I knew it was terrible. My grandparents and parents worked hard all their lives for the Labour Party, but not with as much passionate dedication as I did (and all my cousins), from 1968 on. There was a two hour analysis of Whitlam’s life and times on ABC tonight… it still makes me weepy, almost 40 years after the Kerr and the Dismissal. My parents and brothers are all Liberal voters. If, as they probably hoped, my voting Labor was a youthful aberration, then it’s a very long-standing one.